A nice, clean shave makes you look and feel instantly put together. Contrary to popular belief, however, there’s more to shaving that just running a razor along your skin. Taking shortcuts or practicing bad habits can result in an uneven shave with razor burn and ingrown hairs. Whether you shave every day or just for special occasions, follow these tips to get a smooth shave - every single time! The best time to shave is right after you take a shower. In the shower, wash your face with a gentle facial cleanser. 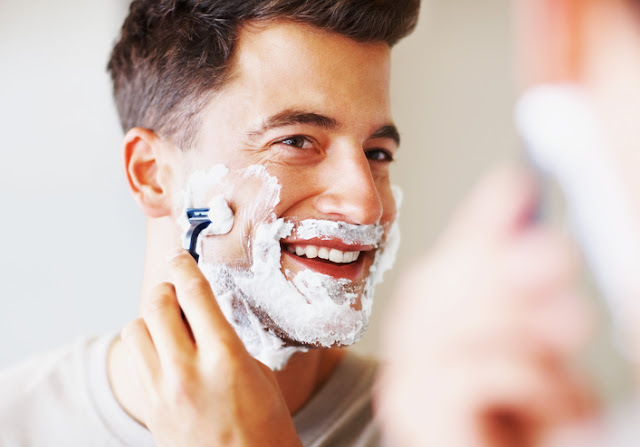 Next, face the spray for a minute or two to thoroughly soak stubble.The hot water from the shower will soften your facial hair for a closer shave. Plus, it will remove any dead skin that can contribute to nicks and cuts. When you step out of the shower, avoid towel-drying your face, since you’ll get the best shave by keeping skin damp. 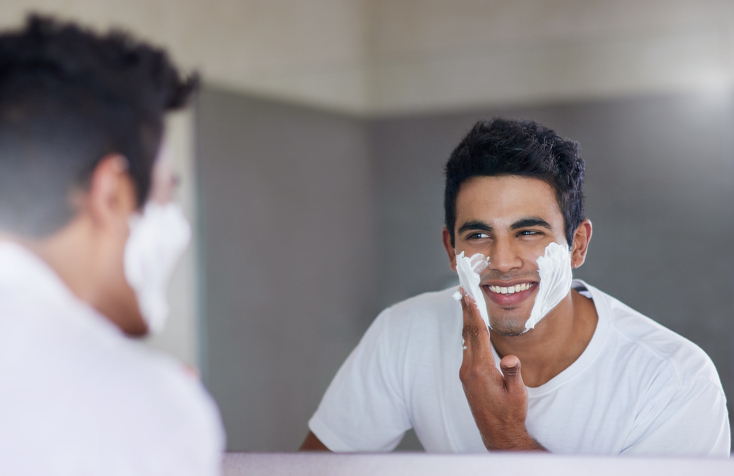 Shaving cream softens your facial hair and provides lubrication to prevent skin irritation. A high quality shaving gel also contains skin-loving ingredients that nourish your skin. We recommend Camouflage Speed Shaving Cream, which contains moisturizing essential fatty acids from sweet almond oil and shea butter. Plus, it has soothing aloe vera and vitamin E to fight skin irritation. Massage shaving cream liberally into skin using clean fingertips and allow to sit for two or three minutes to let the product do its magic. Floss or brush your teeth to pass the time! A nice, sharp, razor will basically do the work for you, allowing you to shave with light, gentle strokes. Avoid pressing too hard - this is how nicks happen! If you have sensitive skin, avoid using razors no more than five times. Otherwise, changing your blade every week or two will do just fine. Using razor shield will also extend the life of your razor. The hair on your cheeks is softer and responds more quickly to shaving cream. Save the more difficult parts (i.e. the upper lip, chin, and around the ears) for last to give the shave cream plenty of time to soften your stubble. Always shave in the same direction the hair grows in short, gentle strokes. Many claim that shaving “against the grain” will result in a smoother shave, but it can actually contribute to razor burn and ingrown hairs. By preparing skin correctly with hot water and shaving cream, you’ll get the same smooth results minus the irritation. When you’re done shaving, rinse your face with cold water to help close pores and soothe skin. Next, moisturize with a high quality facial moisturizer like Camouflage After Shave Lotion. Our after shave lotion contains calming witch hazel to reduce irritation, antioxidant carnosine to defend against aging free radicals. We’ve also included allantoin, which creates a barrier to lock in moisture for all-day hydration. Plus, it smells great. Simply massage after shave lotion into skin, and you’re ready to go! By taking a little extra time and following these simple tips, razor burn will be a thing of the past!